Prime Minister Gordon Brown will not attend the opening ceremony of the Beijing Olympics, Downing Street says. However, he will be at the closing ceremony when the Olympic baton will be passed to London. A spokeswoman said Mr Brown had never planned to attend the opening ceremony and was not boycotting the Games. Number 10 claimed that the Chinese knew Mr Brown would not attend the opening ceremony - but the official state media had reported Mr Brown would be there. Liberal Democrat leader Nick Clegg said Number 10 should have made the situation clear in the first place. He told BBC Radio 4's The World Tonight: "Chancellor Merkel in Germany and President Sarkozy in France saying quite specifically that they might not go to the opening ceremony shows that the debate has always been about the opening ceremony. "So now suddenly to be asked to believe by Number 10 that they never really intended to go in the first place either smacks of a rather odd way of going about things or just downright incompetence." The Olympics minister Tessa Jowell will represent the UK at the opening in Beijing in August. And reporters due to travel with Mr Brown were said to have booked summer holidays on the basis the PM would be going only to the closing ceremony. However, it appears the Chinese believed that Mr Brown - who has talked of Britain attending "ceremonies" - would be at the setpiece opening ceremony. On 27 March, at a press conference during France's President Sarkozy's visit, he said: "We will not be boycotting the Olympic Games; Britain will be attending the Olympic Games ceremonies. "At the same time, the president has said that the Dalai Lama has not called for a boycott of the Olympic Games." At his Downing Street news conference on 1 April, Mr Brown said: "I think President Sarkozy said himself that he expected Britain, because we are going to host the next Olympics, to be present at the Olympic ceremonies and I will certainly be there." BBC sports editor Mihir Bose said Mr Brown's decision not to attend the opening ceremony was in keeping with his attitude to China's Olympics - that he has to do his duty without being seen as a supporter. The UK needs to be represented at the closing ceremony because London takes over from Beijing as the next Olympic city. 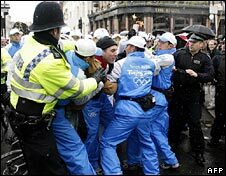 He said Mr Brown was not alone in agonising over how to respond to the worldwide protests surrounding the 2008 Games. The International Olympic Committee, which has gathered in the Chinese capital, is also wrestling with its strategy, our correspondent added. The Olympic torch has arrived in San Francisco under tight security for the sixth leg of its round-the-world relay. Confusion marked the start of the only North American leg of the relay, as its route was diverted to avoid thousands of protesters. Crowds of pro-Tibetan and pro-Beijing demonstrators are on the streets, prompting fears of violence. Shortly before the relay began, police said the route would be cut. Then the lit torch was carried away from crowds. Protests have already caused serious disruption to legs of the relay in London and Paris. In Paris, the torch had to be extinguished three times, while in London there were 37 arrests. 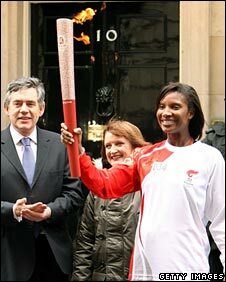 Mr Brown attracted controversy for receiving the Olympic torch outside 10 Downing Street, although he did not hold it. Most demonstrators are protesting over a security crackdown in Tibet after anti-Chinese unrest.